The drone market is a great example of how quick advancements in technology can bring down prices and increase functionality. In the early days of drones, it felt like you needed years of RC piloting experience, but not anymore. Even at the cheaper end of the market, drones are easier than ever to fly and have loads of features only available on the most expensive units up until a few years ago. Stabilized onboard cameras, flight controls, rechargeable batteries, and built-in safety features are all now commonplace. All the drones listed here are great ways to practice your flight skills before you move to more professional units and won’t break the bank. The cheapest of the cheap have been left out simply because they have a limited feature set, less motor power, and low-quality cameras. They will serve the purpose of a bit of flying fun, but you will soon outgrow them for the difference of just spending a few extra dollars. Learn the basic manual controls of a drone and the skills will serve you well in the long run. The two stick approach works with all drones, especially in the universal ‘Mode 2’ for controlling the throttle (up and down) and the rotation (yaw) with the left stick and flight (roll & pitch) with the right stick. The only way to get your head around this functionality is with lots of practice, which is where the beginner drones com into play. With the flight tech designed by DJI, one of the best makers in the drone business, you know this unit will have some great features. For a little over $100, this drone is like a mini version of the DJI Mavic with instantly recognizable features. The unit is fully programmable and can be adapted to your own way of flying, along with coding in Scratch for the younger pilots out there. The unit weighs 80g, with a robust design, built to take some of the knocks of early flight training. If you want a cheap and feature rich drone, then this is a good start point. 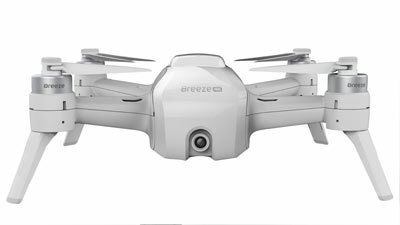 The Yuneec Breeze is one example of drone where the price has dropped dramatically due to newer models being released, but there’s still plenty of quality and value for money here. 4K video, 13MP stills, and a Live 720 HD live stream as standard, along with flight modes such as Selfie mode, Orbit mode and Follow me mode. Being a little more expensive than the unit above, there are features such as Auto-landing and auto return-to-home, perfect for the beginner. The unit also has built-in GPS, so you can plot a route through its own app. This is a solidly built drone which will give you loads of fun flying experience with some great functionality. If you need a cheap drone which features great functionality for stable flight and GPS, the Hubsan X4 is a great choice. The GPS feature alone makes this a worthy buy as the different flight modes work more like more expensive units integrated with flight GPS. The GPS features auto-positioning, follow me mode, auto return to home and creates very steady flight. With a robust build and being very compact, this unit would be ideal for the beginner. This could be one of the best drones to start into the world of aerial photography. At this price point, many drones may feature some sort of camera, but the Hubsan H502S X4 has 120º field-of-view which can record video at 720p. This is linked to the provided FPV real-time transmission and can be viewed through VR Glasses for a fully immersive experience. There are plenty of sensors on this drone to keep everything stable in flight, with features like Altitude Hold and Emergency Stop function if the drone becomes uncontrollable or out of sight. This is another entry-level drone which has been around for a few years and has thus dropped in price a little. This means that you’re getting plenty of features for your money and still contemporary technology. This is more of a first-time drone for practice, but you still get a reasonable HD camera and plenty of flight assist modes. The unit has 6-axis stabilization for steady flight with a provided RC handset for choosing different modes like 3D lock and scheduled flight. The SYMA X5C has pitch and roll as found on more expensive drones, along with colored lights underneath to help you locate and check the drone’s orientation. If you want to jump up in functionality and quality, along with great video and stills and you can’t go wrong with the DJI Spark. 1080p HD video and 12-megapixel stills with a 2-axis camera gimbal make for great footage. Face and gesture detection are great responsive features and with a 100m range or 2km with the optional radio control, this is a little out of the beginners market, but a worthy step up. The drone has the usual DJI build quality and a 36kph maximum speed. There are other well-priced drones on the market with similar sets of features and equal build quality, but without the same quality of camera. If a flight practice drone is all you need, then you could opt. for some of the well-priced racing or stunt drones available such as the Nikko Air DRL Race Vision 220 FPV. These are set up to be more adept at aerial stunts, but it’s also a great way to get to grips with the initial flying experience.